This is a hilly one. We'll see 2000+ metres of climbing as we hit a couple of spots that have been on my todo list for ages. We'll start out of Hurstbridge (NOT Fed Square, woohoo!) and head straight to Buttermans Track which will take us up and over to Yarra Glen. From there we'll hit Long Gully Road on up to the town of Toolangi for a refuel. Then it's time to get amongst the big boys - straight into the Toolangi State Forest for a long climb around Mt Tanglefoot before dropping down to follow the Murrundindi River up to Glenburn. We'll fuel up at Glenburn and then take Kinglake from behind before coasting back down to Hurstbridge with a salt-crusted grimace and a thousand yard stare. Bring your climbing legs, this one's going to hurt. Met Tom on the train out to Hurstbridge. Hung around until 9:30 at the station and it looked like there were no other takers so we rolled out. It was a nice sunny day as we rolled through Panton Hill and on past Smiths Gully. Just past Smiths Gully we hit the first dirt of the day... literally. We flew down Spanish Gully Road - which I've ridden before only a couple of weeks ago - and I took way too much speed into the final corner and, as I was clamping down hard on both brakes and feeling the rear squirming all over the shop and skipping over big ruts and rocks I had plenty of time to think, "Oh well, looks like I'm going down." The road turned but I kept going straight until my front wheel dived down into the big ditch on the side and I beefed it hard. I took a solid hit to the side and back and took a bit of bark off my forearms but - due to cat-like reflexes I'm sure - neither my head nor hands touched the ground. Yay. I caught my breath for a bit, washed the gravel out of my arms and started tending to my bike. Twisted the bars back in line and after a bit of adrenaline-addled problem-solving, twisted one brake pad back into shape and it was good to go. Gotta love a solid singlespeed build. We rolled on and hit Buttermans Track, which is awesome. I noticed Tom was dropping behind a little and suspected something may be not right. We were both out of the saddle and cranking our bikes from side to side on the last climb(s) up to Skyline Road and Tom called out a reading from his Garmin, "22 percent!". Bastards. Mercifully, a car came along and we had to get out of the middle of the road onto the side where it was too loose to maintain traction and we both got off and started walking. Lucky us. Coffee, food, lots of motorbikes and Sunday tourists. We refuelled and looked at our options. Tom decided to roll on towards Healesville and then, at the turn-off where we headed north and started the big climb of the day, he'd see if he was feeling any better and make the call whether or not to continue. It was nice rolling hills out to the turn-off at Long Gully Road. Beautiful sunny day; a little too much traffic for my liking but that was a small complaint really. But, no matter how nice the weather, no matter how nice the countryside, no matter how good the riding, you're not going to enjoy it if you guts are ruined and you feel like spewing. Tom wasn't feeling any better so he grudgingly decided to keep going to Healesville and then take Maroondah Hwy back to the train at Lilydale. Bummer. I jokingly pointed out the "No through road" sign on Long Gully Road just before we parted ways. "Don't believe everything you read", I was thinking, and with faith in Mr Google And His Amazing Map Of The World, I pushed on into the unknown. The road pitched up, the trees closed in on either side and the road surface got looser and more unkempt. Nice. This is what I like. And then the road went through a gate and ended at someone's house. Bastards! I'd been googled again. Fortunately I didn't have to backtrack very far to get to the main road up to Toolangi. Unfortunately, I was now forced to ride on the main road up to Toolangi. I spend hours on Google Maps and street-directory.com.au and looking at wiki pages of tiny country towns and scouring "street view" to double-check that roads actually do exist where the maps say they do precisely so I can avoid riding on main roads. This is "There Will Be Dirt" not "There Will Be Main Roads". Anyway, the main road up to Toolangi was actually a really nice gentle climb through some beautiful tall ferny forest. Fantastic. About a brazillion dudes on motorbikes and in four wheel drives thought exactly the same thing and they were all out there "sharing" the road with me as I climbed up to Toolangi. One passenger in a four wheel drive yelled out as they went flying past my elbow "I hope you f**king don't get hit!" Well, I thought I heard the "don't". As I crested the hill into Toolangi I saw a couple of kids stopped on the side of the road with their big road (motor) bikes - one of them upright, the other laying down on it's side on the shoulder. Another vehicle had already stopped and a cop car pulled up just as I was passing. Dickheads racing up and down the hill, 4wders with big "Remington" stickers chasing their mates into the bush to get bogged together and winch each other out, sketchy tourists crawling along behind me holding up traffic in their family cars too scared to pass by even when I'm waving them through and have moved so far off the road that I'm getting slapped in the face by fern trees and almost falling down the hill. Gah! I filled up water at Toolangi and rolled on to the entrance to the Toolangi State Forest. Finally. This was the good bit. This was what we'd set off that morning to ride. And I'm happy to report that it did not disappoint. Big trees. Big hills. Even the gravel on the road was big! And, apart from the odd 4wd flying by in a cloud of dust and noise, it was empty of people. Big, big, old, old forest. Unidentified birds and animals making noises in the trees. Things moving in the undergrowth. Bugs screeching. Birds cawing. Lizards scurrying. Clear, eucalyptus air. Take a deep breath... ahhhh, that's the nature. It was a nice steady climb on a wide, well-kept gravelly road winding up and up Mt Tanglefoot. The road didn't go to the top of the mountain, it climbed to about 900 metres before diving back down the other side to Murrindindi River. From the highest point on the road, a small overgrown walking track snaked up another 100 metres or so to the summit of the mountain. I'd marked that highest point on the road on my trail notes and took a breather when I reached it. I looked at the time and decided not to push on down the other side to Murrindindi River. Time was running out and if I back-tracked my steps to Toolangi I'd bypass about 20km of unknown terrain. I didn't want to be too late home and my back was starting to bother me too. Previously it hadn't hurt to ride but now, as I got more miles under my belt - and climbing miles at that - the big hit I took on my back from when I tried to attack Spanish Gully Road with my torso was making its presence felt. Getting on and off the bike was painful and riding was becoming painful too. So, I back-tracked down to Toolangi - an awesome fast descent after that long climb - and kept rolling westwards on the main road to Kinglake. Damn it. On the main roads again. More traffic. More tourists. More 4wds and motorbikes. I cranked out the k's and finally rolled into Kinglake from behind, but not the behind that I'd planned. Still, beggars can't be choosers and I'd be lying if I said I wasn't glad that it was pretty much all downhill from here to Hurstbridge. 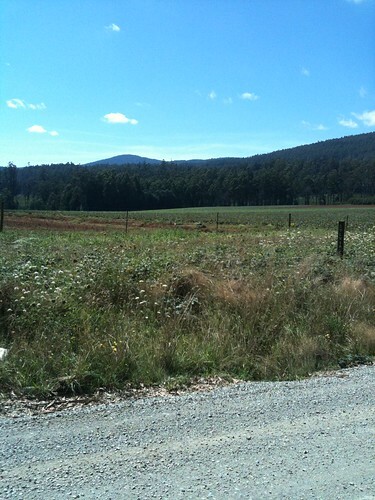 And so, downhill I went, on the main road from Kinglake to Hurstbridge. I've never actually ridden that road before - I've done Humevale Road plenty of times but never done the main Kinglake climb up from St Andrews. It's so freaking narrow! Having seen it now on the way down, I'd love to climb it one day but, jeez, no wonder I hear tales of aggro between cars/motorbikes and cyclists on that road. Not so squeazy!